Altered neuronal development is discussed as the underlying pathogenic mechanism of autism spectrum disorders (ASD). Copy number variations of 16p11.2 have recurrently been identified in individuals with ASD. Of the 29 genes within this region, quinolinate phosphoribosyltransferase (QPRT) showed the strongest regulation during neuronal differentiation of SH-SY5Y neuroblastoma cells. We hypothesized a causal relation between this tryptophan metabolism-related enzyme and neuronal differentiation. We thus analyzed the effect of QPRT on the differentiation of SH-SY5Y and specifically focused on neuronal morphology, metabolites of the tryptophan pathway, and the neurodevelopmental transcriptome. The gene dosage-dependent change of QPRT expression following Chr16p11.2 deletion was investigated in a lymphoblastoid cell line (LCL) of a deletion carrier and compared to his non-carrier parents. Expression of QPRT was tested for correlation with neuromorphology in SH-SY5Y cells. QPRT function was inhibited in SH-SY5Y neuroblastoma cells using (i) siRNA knockdown (KD), (ii) chemical mimicking of loss of QPRT, and (iii) complete CRISPR/Cas9-mediated knock out (KO). QPRT-KD cells underwent morphological analysis. Chemically inhibited and QPRT-KO cells were characterized using viability assays. Additionally, QPRT-KO cells underwent metabolite and whole transcriptome analyses. Genes differentially expressed upon KO of QPRT were tested for enrichment in biological processes and co-regulated gene-networks of the human brain. QPRT expression was reduced in the LCL of the deletion carrier and significantly correlated with the neuritic complexity of SH-SY5Y. The reduction of QPRT altered neuronal morphology of differentiated SH-SY5Y cells. Chemical inhibition as well as complete KO of the gene were lethal upon induction of neuronal differentiation, but not proliferation. The QPRT-associated tryptophan pathway was not affected by KO. At the transcriptome level, genes linked to neurodevelopmental processes and synaptic structures were affected. Differentially regulated genes were enriched for ASD candidates, and co-regulated gene networks were implicated in the development of the dorsolateral prefrontal cortex, the hippocampus, and the amygdala. In this study, QPRT was causally related to in vitro neuronal differentiation of SH-SY5Y cells and affected the regulation of genes and gene networks previously implicated in ASD. Thus, our data suggest that QPRT may play an important role in the pathogenesis of ASD in Chr16p11.2 deletion carriers. Altered neuronal development is suggested to be one of the major drivers in the etiology of autism spectrum disorders (ASD). Neuropathological studies based on postmortem brains of ASD patients reported aberrant neuronal development including reduced dendritic branching in the hippocampus , smaller pyramidal neurons in the language associated Broca’s area , abnormal minicolumnar organization in the cerebral cortex leading to decreased inter-areal connectivity , and disorganized layers of the cortical areas . The underlying etiology of ASD is mainly based on different genetic findings including de novo copy number variations (CNVs). These CNVs, in particular deletions, have been recurrently shown to alter genic regions in ASD individuals , specifically affecting neurodevelopmental genes . One of the most recurrent CNVs in ASD resides within Chr16p11.2 spanning ~ 600 kb. Overall, duplications and deletions of 16p11.2 can be identified in 0.8% of ASD cases . A deletion of this region is associated with a nine times higher likelihood of developing ASD, and the duplication is associated with a nine times higher risk of both ASD and schizophrenia . While developmental delay or intellectual disability can occur in some cases of 16p11.2 duplication carriers, they are more common in deletions [9, 10]. The 16p11.2 CNV region spans 29 genes which showed gene dosage-dependent expression in lymphoblastoid cell lines (LCLs) of CNV carriers, leading to a differential expression of genes implicated in biological processes such as synaptic function or chromatin modification . A study in zebrafish showed that the majority of the human Chr16p11.2 homologous genes are involved in nervous system development: loss of function of these genes led to an altered brain morphology for 21 of 22 tested genes . Double heterozygous knockouts of the Chr16p11.2 homologs double C2 domain alpha (DOC2A) and family with sequence similarity 57, member Ba (FAM57BA) induced hyperactivity, increased seizure susceptibility and increased body length and head size in zebrafish . In mice, CNVs of the homologous 16p11.2 region induced differing phenotypes. Two studies reported the deletion to result in a reduction of the skull  or brain size , accompanied by gene dosage-sensitive changes of behavior and synaptic plasticity  as well as altered cortical cytoarchitecture, and reduction of downstream extracellular signaling-related kinase (ERK/MAPK) effectors . Comparing individual brain regions in mice with deletions to wild-type animals, Horev and associates identified six regions with an increased volume, which were not altered in duplication carriers (see Dataset S04 in the original publication ). In another study, mice carrying a heterozygous microduplication of the region showed increased dendritic arborization of cortical pyramidal neurons . Via network analysis of protein-protein-interaction, the authors identified the gene coding for mitogen-activated protein kinase 3 (MAPK3) as hub gene. MAPK3 plays a role in signaling cascades involved in proliferation and differentiation. A recent study focused on different effects of 16p11.2 deletions in male and female mice and reported impairments of reward-directed learning in male mice accompanied by male-specific overexpression of dopamine receptor D2 (DRD2) and adenosine receptor 2a (ADORA2A) in the striatum . Both genes have been discussed in the context of ASD [19, 20]. While the functional validation of the entire CNV models the genomic status of the patients, investigating gene dosage effects of single genes located in Chr16p11.2 is useful to understand their individual contribution to the complex and diverse pathologies of ASD. In zebrafish, the suppression of potassium channel tetramerization domain containing 13 (KCTD13) was associated with macrocephaly whereas overexpression led to microcephaly . In mice, the same study showed a reduction of KCTD13 to result in increased proliferation of neuronal progenitors, which is also suggested to result in macrocephaly. Further, a heterozygous deletion of the gene coding for major vault protein (MVP) induced a reduction of functional synapses in mice . TAO kinase 2 (TAOK2), also located in 16p11.2, was found to be essential for the development of basal dendrites and axonal projections in cortical pyramidal neurons of mice . Chr16p11.2 genes DOC2A, KIF22, and T-box 6 (TBX6) are required for the development of neuronal polarity in mouse hippocampal cultures . In ASD patients, multiple brain measures such as the thalamic or total brain volume were reported to be increased in 16p11.2 deletion carriers and reduced in duplication carriers [25, 26]. Another study integrated physical interactions of 16p11.2 proteins with spatiotemporal gene expression of the human brain. The authors identified the KCTD13-Cul3-RhoA pathway as being crucial for controlling brain size and connectivity . Still, only few genes of the Chr16p11.2 region have been investigated for their specific role in neuronal differentiation in human models. Here, we investigated the SH-SY5Y neuroblastoma cell model as a well-studied and feasible model for neuronal differentiation in vitro. Previously, we reported that a continuous application of brain-derived neurotrophic factor (BDNF) and retinoic acid (RA) leads to neuronal cells of most likely cortical identity with a transcriptomic signature reminiscent of that of neocortical brain tissue developed for 16–19 weeks post-conception . In addition, we showed expressed genes in the differentiated SH-SY5Y model to be co-regulated within modules, several of which were associated with neurodevelopmental disorders such as the orange module. We then implemented three complementary statistical methods to identify genes that were (i) differentially regulated upon differentiation, (ii) significantly involved in the independent processes active during differentiation and/or (iii) that were significantly changed over time. Finally, we described a list of 299 robustly regulated genes that appeared to be significant in all three analyses . We here report that of the 29 genes located within Chr16p11.2, a total of 10 genes were identified by at least one of the three implemented statistical approaches. However, only the gene coding for quinolinate phosphoribosyltransferase (QPRT) was identified by all three analyses. In addition, QPRT was one of the most highly expressed genes of the Chr16p11.2 region and showed the highest regulatory fold change (FC) after induction of neuronal differentiation. Also, QPRT was co-regulated with an early upregulated gene module (MEorange) which showed significant enrichment for ASD candidate genes . QPRT codes for an enzyme of the kynurenine pathway, the primary route for tryptophan catabolism, which results in the production of nicotinamide adenine dinucleotide (NAD+). In addition, it is the only enzyme catabolizing quinolinic acid (QUIN), a potent excitotoxin acting as N-methyl-D-aspartate receptor (NMDA-R) agonist. QUIN is also linked to astroglial activation and cell death as originally identified in the context of Alzheimer’s disease . QPRT-KO mice showed increased QUIN levels in the brain  and increased excretion of QUIN in urine . A significant increase of QUIN was observed in blood plasma of children with ASD when compared to their age-matched healthy control siblings . Furthermore, QPRT was identified as an interaction partner of the ASD candidate neuroligin 3 (NLGN3; ), suggesting an involvement of QPRT in the formation of the postsynaptic density. Here, we hypothesized that QPRT is implicated in neuronal differentiation and that reduced QPRT expression following its deletion results in alterations of neuromorphological development. We first tested the gene dosage-dependent expression of QPRT in a patient-specific LCL of one Chr16p11.2 deletion carrier. We then analyzed the expression of QPRT and its co-regulated gene set for correlation with the development of neuronal morphology in SH-SY5Y wild-type (WT) cells. To study the effects on neuronal morphology, we inhibited QPRT function in SH-SY5Y cells using (i) siRNA knockdown (KD), (ii) chemical mimicking of loss of QPRT, and (iii) complete CRISPR/Cas9-mediated knock out (KO). QPRT-KD cells underwent morphological analysis. Chemically inhibited and QPRT-KO cells were characterized using viability assays. To understand the effects of QPRT loss on the kynurenine pathway and QUIN levels, we additionally performed a metabolite analysis of the generated QPRT-KO cells. To explore the systems-wide interaction network of QPRT, we investigated the transcriptomic signature of QPRT-KO cells. Finally, to understand the role of QPRT in neural development, we tested the genes associated with QPRT-KO for enrichment among gene-networks implicated in human brain development . Lymphoblastoid cell lines (LCLs) were generated as previously published [35, 36]. We investigated LCLs generated from one Chr16p11.2 heterozygous deletion carrier and his non-carrier parents. The child was diagnosed with autism (ICD10: F84.0) based on both the Autism Diagnostic Interview-Revised (ADI-R; [37, 38]) and the Autism Observation Schedule (ADOS; ). The patient presented with a severe impairment of social interaction, hyperactive and aggressive behavior as well as language delay, and an average non-verbal IQ = 90. The deletion was identified in a screen of 710 children with ASD and their parents using the Illumina Human OmniExpress Microarray and validated via real-time PCR (unpublished data). To investigate QPRT gene expression at transcriptional level in exponentially growing cell cultures of the Chr16p11.2 deletion carrier compared to his non-carrier parents, 1 × 106 viable cells were inoculated into 5 ml RPMI medium supplied with 10% fetal bovine serum (FBS), 100 U/ml penicillin, 100 μg/ml streptomycin, 1X GlutaMAX (all from GIBCO®, Life Technologies, Paisley, UK). Volume was doubled when cultures reached a density of 1 × 106 cells/ml. Finally, cells were harvested with a total volume of 20 ml at a density of again 1 × 106 cells/ml. Whole RNA was extracted, including DNase treatment, and reversely transcribed using the GeneJet RNA Purification Kit and the RevertAid H Minus first strand cDNA synthesis kit (both from Thermo Fisher Scientific) following the manufacturer’s protocols. Real-time RT-PCR was performed using the Universal Probe Library (UPL; Roche) and a StepOne Plus device (Applied Biosystems) and normalized to glucuronidase beta (GUSB; see Additional file 1: Supplementary Methods and Table S1). Out of possible cell types to investigate neuronal differentiation, SH-SY5Y is well studied, feasible, and with an optimized protocol shows reproducible differentiation of cells into cortical-like neurons . For proliferation, cells were cultured in Dulbecco’s modified Eagle’s medium (DMEM) supplemented with 10% FBS, 1% sodium pyruvate (all from Life Technologies), and 1% penicillin/streptomycin (PAA). As described in our previous study , SH-SY5Y cells were differentiated using a continuous application of retinoic acid (RA) and brain-derived neurotrophic factor (BDNF). Differentiation media consisted of Neurobasal®-A medium supplemented with 1x GlutaMAX, 1x B-27 supplement (all from Life Technologies), 10 μM RA, 2 mM cAMP (both from Sigma-Aldrich), 50 ng/ml hBDNF (Immunotools), 1% penicillin/streptomycin (PAA), and 20 mM KCl. Cells were differentiated for 11 days changing the medium every other day. The time points for extraction of mRNA or protein and imaging were set 24 h after media changes (0/undifferentiated cells, 1, 3, 5, 7, 9, and 11 days of in vitro differentiation). To study the morphological development of WT SH-SY5Y cells during neuronal differentiation, we transfected proliferating cells with pmaxGFP (Lonza) using Metafectene Pro (Biontex) according to the manufacturer’s protocol. One day after transfection, cells were seeded 1:2 in co-cultures with untransfected cells with a density of 1 × 104 cells/cm2 to allow imaging of individual transfected cells. Cultures were imaged using a Motic AE31 fluorescence microscope (Motic). Images were analyzed using custom macros in ImageJ  available on request. In short, all images were equalized, despeckled, and the background was subtracted using the rolling ball method prior to binarization (Auto threshold “Otsu-dark”). Sholl analysis , a concentric circle method, was performed using the respective ImageJ plugin with manual selection of the cells’ center and with fitting polynomial regression of the fifth degree, as suggested by the manual . The following morphological parameters were assessed: maximum intersections (maximum number of neuritic intersections for one radius), sum of intersections (sum of all intersections of one cell), enclosing radius (the outer radius intersecting the cell, describing the longest distance between soma and neurites), intersecting radii (number of radii intersecting a cell, also describing the distance between soma and neurites), average number of intersections (the number of intersections analyzed divided by the number of intersecting radii; a measure describing neuritic complexity) and maximum intersections radius (the distance from the soma where most neurites are present, i.e., the site of the highest branching density; also reflecting neuritic complexity). Morphological parameters have been assessed in parallel during the previous transcriptomic analysis . We made use of the previously published whole transcriptome data of differentiating SH-SY5Y cells (gene expression omnibus repository (GEO) under the accession number GSE69838 ) and analyzed QPRT expression as well as regulation of modules of co-expressed genes for correlation with the simultaneously assessed morphological parameters of SH-SY5Y neuronal differentiation (see also the “Statistical analysis” section below). Furthermore, QPRT expression during neuronal differentiation was validated in the same mRNA extracts using real-time RT-PCR. RNA extraction, cDNA generation, and real-time RT-PCR were performed as described above and in Additional file 1: Supplementary Methods. Expression values were normalized to GUSB and glyceraldehyde-3-phosphate dehydrogenase (GAPDH). QPRT expression in SH-SY5Y was reduced using three different siRNAs (siQ1–siQ3) and compared to a non-targeting control siRNA (siCtrl) using the Ambion Silencer Select siRNAs (Thermo Fisher; Additional file 1: Supplementary Methods). siRNA-generated KD of QPRT after 11 days of differentiation was proven in parallel to the morphological analysis on protein level via Western Blot as described in Additional file 1: Supplementary Methods. In short, QPRT (mouse anti-QPRT, Abcam) and control β-Actin (ACTB; mouse anti-β-Actin, Sigma) were detected using the secondary antibody anti-mouse IgG HRP-conjugated (Santa Cruz), the ECL Prime Western Blot Detection Reagent, and the Amersham Hyperfilm ECL (both from GE Healthcare). To allow imaging of fluorescent single cells in order to study morphological effects of QPRT knockdown, we co-transfected SH-SY5Y cells with mCherry (Plasmid #30125; Addgene). In a 96-well format, 5.2 × 104 cells/cm2 were reversely transfected with 120 ng of mCherry and 5 nM siRNA using Lipofectamine RNAi Max and OptiMEM (Thermo Fisher). CRISPR/Cas9 gene editing was performed as described elsewhere . In short, sgRNAs were designed  and oligos were ordered from Sigma-Aldrich and cloned into pSpCas9(BB)-2A-Puro (PX459) V2.0 (Plasmid #62988; Addgene). Two sgRNAs targeting different sequences of QPRT were designed to generate homozygous knock out in addition to the non-targeting empty control vector (see Additional file 1: Supplementary Methods and Supplementary Results). Validated plasmids (Sanger sequencing) were transfected into SH-SY5Y cells using Metafectene Pro (Biontex) according to the manufacturer’s protocol with subsequent puromycin (Sigma-Aldrich) selection using 750 ng/ml for 7 to 14 days. After low-density seeding, single clones were isolated using 5 μl of Trypsin-EDTA (Thermo Fisher Scientific) and expanded in 96-well plates. Overall, we sequenced at least ten clones per construct and confirmed homozygous single cell clones at least twice by Sanger sequencing including the empty control vector. Clones were named as follows: del268T (QPRT NM_014298 del268T; Ex2.1), ins395A (QPRT NM_014298 ins395A; Ex2.2), eCtrl (empty control vector). Both indels induced premature stop codons as validated in silico and by Sanger sequencing. KO of QPRT was further shown on RNA and protein level using real-time RT-PCR and Western Blot, respectively. RNA extraction, cDNA generation, and real-time RT-PCR as well as protein extraction and Western Blots were performed as described above and in Additional file 1: Supplementary Methods. RNA expression values were normalized to GUSB and GAPDH, and protein expression was descriptively compared to GAPDH expression. The day after transfection (see above), media were changed from proliferation to differentiation media. After changing the media every other day for a time course of 11 days, cells were imaged using an ImageXPress Micro XLS (Molecular Devices). Images were pre-processed in MetaXPress and analyzed in ImageJ using Sholl analysis (as described above). To measure the effect of chemical QPRT inhibition, we seeded WT SH-SY5Y cells with a density of 2.5 × 104 cells/cm2. After cells have attached overnight, media were changed to either fresh proliferation or differentiation media containing 0 (reference), 5, or 10 mM of the QPRT inhibitor phthalic acid (PA; Sigma; directly diluted in the respective media; ) and incubated for 3 days followed by propidium iodide (PI) viability assays. PI and Hoechst33342 (both from Sigma) were pre-diluted in DPBS (Life Technologies) and used with final concentrations of 1 μg/ml and 10 μg/ml for the assay, respectively. Prior to analysis, supernatant including detached and dead cells was removed and attached cells were washed with DPBS. Next, attached cells were incubated with PI and Hoechst33342 for 5 min at 37 °C and imaged using the ImageXPress Micro XLS microscope (Molecular Devices). Images were acquired through DAPI and TRITC channels and analyzed using the MetaXPress macro “Cell Scoring”. Percentage of dead cells after application of 5 and 10 mM PA was compared to the 0 mM reference for proliferating and differentiating cells, respectively. To test if the observed cell death upon chemical inhibition of QPRT during differentiation is driven by an accumulation of the QPRT substrate quinolinic acid (QUIN; Sigma), we exposed WT cells to this neurotoxin. Cells were seeded with a density of 2.5 × 104 cells/cm2 and media were changed after 24 h to either fresh proliferation or differentiation media containing 0 (reference; vehicle H2O only), 5, or 250 μM of QUIN  and incubated for 3 days followed by PI viability-assays (as described above). Percentage of dead cells after application of 5 and 250 μM QUIN was compared to the 0 μM reference for proliferating and differentiating cells, respectively. To measure the effect of QPRT-KO on the viability of differentiating SH-SY5Y, KO and eCtrl cells were seeded at a density of 2.5 × 104 cells/cm2. The following day, media were changed to differentiation media. After 3 days, PI viability-assays were performed (as described above). We further aimed to rescue the effects of a potential QPRT-KO-driven increase of QUIN by inhibiting downstream pathways. Cells were seeded with a density of 2.5 × 104 cells/cm2. After 24 h, media were changed to differentiation media containing (i) 0 (reference; vehicle H2O only), 6, and 12 μM of the NMDA-R antagonist MK801 , (ii) 0 (reference; vehicle H2O only), 0.5, and 1 mM of nitric oxide synthase 1 (NOS1) inhibitor L-NAME , and (iii) 0 (reference; vehicle H2O only), 5, and 10 mM of NAD+ . PI viability assays were performed after an incubation of 3 days (as described above). All rescue experiments were performed with differentiating QPRT-KO cell lines compared to the eCtrl. To characterize QPRT-KO at the level of the kynurenine pathway, i.e., tryptophan catabolism, we analyzed its metabolites in cell culture supernatants using ultra-high-performance liquid chromatography (UHPLC; for tryptophan (TRP), kynurenine (KYN), 3-hydroxykynurenine (3HK), 3-hydroxyanthranilic acid (3HAA), anthranilic acid (AA) and kynurenic acid (KA)), and gas chromatography-mass spectrometry (GC/MS; for picolinic acid (PIC) and QUIN). Cell lines were seeded with a density of 2 × 104 cells/cm2 and grown in proliferation or differentiation media for 3 days as described above. Supernatants of replicates were harvested and stored at − 80 °C until further proceedings. UHPLC and GC/MS were performed as described previously [32, 50] (see also Additional file 1: Supplementary Methods). To investigate the transcriptomic changes induced by QPRT-KO, we performed a whole transcriptome analysis using the RNA-Seq approach MACE. MACE sequencing in contrast to RNA sequencing reads cDNA ends only rather than whole transcripts, i.e., poly-A tails. The output values of MACE-Seq are absolute counts per cDNA end. This approach is more sensitive compared to classical RNA-Seq. This method allows the detection of low abundant transcripts and differentiation between alternative 3′UTRs with high accuracy [51, 52]. However, it does not allow to identify alternative exon usage. Cell lines (three biological replicates of each WT, eCtrl, and KO cells) were seeded with a density of 2 × 104 cells/cm2 in proliferation medium. After 3 days, media were changed to differentiation and cells were differentiated for 3 days without media changes. RNA was prepared as described above. RNA integrity number (RIN) was analyzed using the LabChip GX system and only samples with RINs above 9.7 underwent further analysis. MACE analysis including quality control was outsourced to GenXPro (Frankfurt) . Reads were mapped to the human genome version hg38 using the Bowtie2 algorithm implementing the “--sensitive-local” parameter and standard settings as published . A total of 12 genes found to be significantly differentially expressed in KO cells with an absolute log2 fold change (FC) above 2.5 were chosen for validation via real-time RT-PCR using the UPL system as described above with GAPDH, GUSB, and proteasome 26S subunit, non-ATPase 7 (PSMD7) as housekeeping genes. Additionally, the GOIs QPRT, nicotinamide nucleotide adenylyltransferase 2 (NMNAT2; only downstream enzyme of QPRT differentially regulated upon KO of QPRT), and NLGN3 were included for validation (Additional file 1: Table S1). If not stated otherwise, statistical analyses were performed using R version 3.2.3. Group differences between mRNA expression in LCLs of a deletion carrier compared to his non-carrier parents were tested using t test. Group differences of morphological parameters were tested using ANOVA and pairwise ANOVA (type III error) with Tukey’s honest significant difference (HSD) correcting for multiple testing; Tukey’s FDRs were considered significant below a threshold of FDR ≤ 0.05. Group differences between treated and untreated samples (e.g., PI assays) were tested using t test; uncorrected p values are reported. All samples were compared to their respective control (e.g., non-targeting siRNA) or reference (e.g., 0 mM of inhibitor). Correlation between morphological parameters and gene expression or eigengene expression was tested based on the Pearson’s product moment correlation coefficient following a t-distribution. Reported p values are Bonferroni corrected for 126 tests (6 morphological parameters, 20 gene modules, 1 gene expression). Data of real-time RT-PCR experiments were analyzed using the 2ΔΔCt method . Group differences were tested using t test. For validation of RNA-Seq data, real-time RT-PCR data and RNA-Seq (MACE) normalized reads were tested for correlation as described above using Pearson’s correlation tests. Overall 32,739 transcripts were targeted by MACE analysis and defined as the gene universe (reference gene panel). Differentially expressed genes were identified using the “DESeq2” pipeline  with the gene expression as the dependent variable and the respective groups as the independent variable. No additional covariates have been included since the samples did not differ with respect to RIN, number of total counts, or batch. Hierarchical cluster analysis using the top 2000 genes based on variance was performed to exclude any technical outlier samples (for detailed quality checks see Additional file 1: Figure S6). Four different cell lines underwent MACE analysis: the untreated wild-type (WT), the empty control vector (eCtrl), the KO cell line QPRT−/− del268T, and the KO cell line QPRT−/− ins395A. Three technical replicates were sequenced for each cell line. Differential gene expression induced by QPRT-KO was assessed by comparing (i) WT vs eCtrl, (ii) eCtrl vs KO del268T as well as (iii) eCtrl vs KO ins395A independently. A gene was considered to be significantly associated with QPRT-KO if (i) no significant change was identified between the WT and the eCtrl cell line (FDR > 0.1), (ii) if a significant (FDR < 0.05) difference was observed between both the eCtrl and KO del268T and between eCtrl and KO ins395A, and (iii) the direction of the effect was the same in both of the comparisons eCtrl vs KO del268T and eCtrl vs KO ins395A, respectively. For the differential expression analysis between two groups, raw counts of the respective replicates were loaded into DESeq2 using the “DESeqDataSetFromMatrix” function. Differential expression was estimated using the function “DESeq” with the option “fitType = ‘local’”. Significantly up and downregulated genes underwent GO term analysis (Additional file 1: Supplementary Methods). Genes surviving quality check (more than 10 reads per gene in at least 6 of the 12 samples) were subjected to weighted gene co-expression network analysis (WGCNA; Additional file 1: Supplementary Methods). To gain a deeper insight into the brain-specific effects of up and downregulated genes from MACE analysis, we used part of a framework proposed by Yousaf et al. . In short, this framework uses the Allen Brain Atlas dataset of Kang and colleagues, who have identified 29 co-regulated gene sets using the spatiotemporal transcriptome of the human brain from early embryonal development to late adulthood . Each module corresponds to specific biological processes involved in brain development and aging. We tested these modules for enrichment with the sets of genes up or downregulated upon QPRT-KO in SH-SY5Y using Fisher’s exact tests. Expression patterns of the enriched modules were then visualized using heatmaps of the eigenvalues of the respective modules for each human brain region over time. To replicate previous reports  of altered QPRT expression in 16p11.2 CNV carriers, we compared QPRT expression in a patient-specific LCL of a deletion carrier and his unaffected parents. We confirmed a dosage dependent expression of QPRT at mRNA level (16p11.2 deletion carrier vs. non-carrier parents; logFC = − 0.68, p = 0.014; Additional file 1: Figure S1a). RNA expression of QPRT during SH-SY5Y differentiation significantly correlated between microarray  and real-time RT-PCR (ρ = 0.88; p = 0.0098; Additional file 1: Figure S1b). Further, we used the expression data of QPRT as well as of the modules of genes co-regulated during neuronal differentiation and tested them for their correlation with morphological parameters using Sholl analysis during 11 days of neuronal differentiation (Additional file 1: Figure S1c and d). Both QPRT expression and the eigenvalue of its associated module (MEorange) significantly correlated with the average number of intersections (QPRT microarray: ρ = 0.86, FDR = 8.16E−05; QPRT RT-PCR: ρ = 0.54, FDR = 0.020; MEorange: ρ = 0.93, FDR = 1.71E−07; Additional file 1: Figure S1d). In summary, we report a correlative association between QPRT expression and a measure for the development of neurite complexity during in vitro neuronal differentiation of wild-type SH-SY5Y cells. To investigate if the correlation of QPRT expression with neuritic complexity is causal or secondary, i.e., due to the progressive neurite growth over time, we performed functional inhibition analysis of QPRT. All three siRNAs targeting three different sites of QPRT (named here siQ1–siQ3) induced a decrease in QPRT protein after 11 days of differentiation as confirmed by Western Blot (Fig. 1a). At neuromorphological level, KD cell lines compared to control cell lines (siCtrl) showed a significant decrease of the maximum intersections radius, altering neuritic complexity in that the site of highest branching density was shifted closer towards the soma (p siQ1 0.027, siQ2 0.001, siQ3 3.8E−04; means [SD] siCtrl 103.98[115.54]; siQ1 56.50[80.53]; siQ2 56.29[97.17]; siQ3 41.51[76.70]). The overall cell size or the enclosing radius, did not change upon KD of QPRT (all p > 0.6; means [SD] siCtrl 349.60[223.68]; siQ1 286.98[125.05]; siQ2 270.06[135.62]; siQ3 293.81[176.86]; Fig. 1a; Additional file 1: Figure S2). Cells exposed to an inhibitor of QPRT, the chemical phthalic acid (PA), showed an increased cell death upon induction of differentiation, and thus no end-point morphological analysis was performed. Application of PA for 3 days led to a dosage-dependent increase of cell death during differentiation (5 mM PA: FC = 1.81, p = 0.019; 10 mM PA: FC = 4.21, p = 0.039) but not during proliferation (5 mM PA: FC = 0.73, p = 0.432; 10 mM PA: FC = 0.68, p = 0.355; Fig. 1b). We further hypothesized that inhibition of QPRT might lead to increased levels of its neurotoxic substrate quinolinic acid (QUIN). Thus, we exposed wild-type cells to elevated QUIN levels. However, we did neither observe an increase in cell death during proliferation (all p > 0.3 for 5 μM and 250 μM QUIN) nor during differentiation (all p > 0.3 for 5 μM and 250 μM QUIN; Additional file 1: Figure S5a) compared to vehicle only (0 μM). Since the findings from chemical inhibition and mimicking of QPRT inhibition suggested that QPRT is causally linked to differentiation deficits independent of its substrate QUIN, we aimed at elucidating the underlying processes in SH-SY5Y cells with a stable loss of QPRT. Using two separate sgRNA sequences (see Additional file 1: Supplementary Methods and Supplementary Results), we generated two homozygous QPRT-KO cell lines, del268T and ins395A (NM_014298), both of which showed a nearly complete loss of expression of QPRT mRNA expression (proliferating cell lines: del268T: below detection limits, ins395A: FC = 0.17, p = 0.046; 2 days of differentiation: del268T: FC = 0.13, p = 0.003; ins395A: FC = 0.15, p = 0.003; all compared to the proliferating empty control vector (eCtrl); Additional file 1: Figures S3 and S4). For proliferating cells, QPRT-KO was furthermore descriptively confirmed at protein level (Additional file 1: Figure S4). While the eCtrl and both QPRT-KO cell lines were growing comparably during proliferation, both KO cell lines died upon differentiation. After 3 days of differentiation, we observed a significant increase of cell death in the KO cell lines when compared to eCtrl cells harboring the empty control vector (eCtrl to del268T: FC = 2.23, p = 8.2E−04; eCtrl to ins395A: FC = 1.76, p = 5.2E−04; Fig. 1c), and after 9 days of differentiation, merely no differentiating KO cells were detected under the microscope (Fig. 1d). We tried to rescue the QPRT-KO effect by inhibiting the effector pathways downstream of QUIN, i.e., inhibit a potentially induced neurotoxicity by hyperactivation of NMDA-R as well as replenish NAD+, which is the downstream metabolite of QPRT as well as the final outcome of the kynurenine pathway. Neither the NMDA-R antagonist MK801 (both QPRT-KO compared to eCtrl: FC > 1.7, p < 3.9E−03 for 0 μM; FC > 1.6, p < 0.04 for 6 μM; FC > 1.6, p < 1.5E−03 for 12 μM) nor the inhibition of the NMDA-R downstream enzyme NOS1 by L-NAME (both QPRT-KO compared to eCtrl: FC > 1.3, p < 0.05 for 0 mM; FC > 1.3, p < 0.02 for 0.5 mM; FC > 1.5, p < 0.01 for 1 mM) nor supplying NAD+, the downstream product of tryptophan catabolism (both QPRT-KO compared to eCtrl: FC > 1.3, p < 9E−03 for 0 mM; FC > 1.3, p < 1.6E−03 for 5 mM; del268T compared to eCtrl: FC = 1.20, p = 0.1; ins395A compared to eCtrl: FC = 1.54, p = 0.009 for 10 mM), resulted in a significant reduction of cell death for both of the KO cell lines upon differentiation (Additional file 1: Figure S5b). To test if the loss of QPRT results in an altered metabolite profile of the kynurenine pathway, we implemented UHPLC and GC/MS analysis. We were able to detect tryptophan (TRP), kynurenine (KYN), kynurenic acid (KA), 3-hydroxykynurenine (3HK), anthranilic acid (AA), and picolinic acid (PA). QUIN could not be detected in any of the samples, while 3-hydroxyanthranilic acid (3HAA) could only be detected in the differentiated (eCtrl and both of the KO) cell lines only. However, no significant changes could be observed in any of the metabolites when comparing both of the QPRT-KO cell lines to the control cell lines (Additional file 1: Figure S5c). Since in our cell model the effect of QPRT-KO on neuronal differentiation was not related to changes in the kynurenine pathway or the neurotoxic effects of QUIN, we aimed to further elucidate the effect of the KO on differentiating cells implementing a transcriptome-wide analysis. Overall, we were able to measure the expression of 32,739 transcripts (Additional file 2: Table S2). Statistical analysis identified 269 differentially regulated genes (103 upregulated and 166 downregulated; Fig. 2a; Additional file 2: Table S2) expressed in all three replicates of both KO cell lines, all with an FDR ≤ 0.05. The 12 genes (Table 1) with an absolute log2FC > 2.5 were technically validated using real-time RT-PCR with an average correlation between RNA sequencing data and real-time RT-PCR of ρ = 0.91 (SD = 0.10). QPRT-KO was also confirmed (eCtrl vs del268T: log2FC = − 2.44, FDR = 1.07E−207; eCtrl vs ins395A: log2FC = − 3.17, FDR = 9.88E−291). Of the genes coding for components of the kynurenine pathway, only NMNAT2 was significantly downregulated upon QPRT-KO (eCtrl vs del268T: log2FC = − 0.70, FDR = 2.10E−07; eCtrl vs ins395A: log2FC = − 1.51, FDR = 6.70E−28). The ASD-implicated protein NLGN3 was differentially downregulated in the del268T only (eCtrl vs del268T: log2FC = − 0.43, FDR = 6.58E−02; eCtrl vs ins395A log2FC = − 0.09, FDR = 9.15E−01) and was thus not considered to be regulated upon KO of QPRT. The genes upregulated upon KO of QPRT were enriched (all p values < 0.05, Fig. 2b; Additional file 3: Table S3) for GO annotated biological processes involved in neurotransmitter secretion, regulation of synapse structure, or activation (Fig. 2b) but also negative regulation of cell growth and negative regulation of cytoskeleton organization among others (Additional file 3: Table S3). In addition, upregulated genes were enriched for the GO term apoptotic process involved in morphogenesis via the genes BCL2 antagonist/killer 1 (BAK1) and scribbled planar cell polarity protein (SCRIB). Genes downregulated in KO cell lines showed enrichment for GO terms including synapse organization, modulation of excitatory postsynaptic potentials, or glutamate secretion (Fig. 2b) or positive regulation of neuron differentiation, positive regulation of dendritic spine development as well as ion transmembrane transport (Fig. 2b; Additional file 3: Table S3). We also observed significant enrichment for ASD genes among highly differentially regulated candidates. Of the 269 differentially regulated genes, 15 were listed in the SFARI gene  with an evidence score of 4 or better (p = 9.2E−04, odds ratio OR [95% confidence interval] = 2.68 [1.47–4.54]), for example gamma-aminobutyric acid type A receptor beta 3 subunit (GABRB3), potassium voltage-gated channel subfamily Q member 3 (KCNQ3), syntrophin gamma 2 (SNTG2), or contactin associated protein-like 2 (CNTNAP2). A total of eleven out of 166 downregulated genes and one gene of 103 upregulated genes showed a |log2FC| > 2.5 (Table 1). Literature search for these twelve highly regulated genes revealed that six had been published in the context of ASD before (Table 1). At gene network level, we identified 20 co-regulated modules upon KO. Here, QPRT was co-regulated within a module associated with modulation of synaptic transmission, synaptic vesicle exocytosis, or limbic system and diencephalon development (Fig. 2c) as well as neurotransmitter secretion or negative regulation of neurogenesis (p < 0.04). Overall, the eigenvalue of this module was not different between controls and KOs. We identified one co-regulated gene set (dark grey, Fig. 2c) to be associated with QPRT-KO as it was significantly downregulated in both KO cell lines when compared to the control cell lines (KOs versus eCtrl or WT, all p < 8E−07). GO term enrichment analysis of this module again revealed processes involved in brain development and synaptic transmission and plasticity (p < 0.05; Fig. 2c; Additional file 3: Table S3), confirming the association of QPRT-KO with neuronal development. Finally, we aimed to translate the effects of QPRT-KO onto the spatial and temporal gene expression network of the brain using previously published data . In this previous work, the authors report 29 gene modules (termed “Kang-Module” in the following) that are co-regulated during the development of human brain regions. We observe that the QPRT-KO-induced downregulated genes were strongly enriched in the Kang-Modules number 1 (odds ratio OR [95% confidence interval] = 8.86 [3.12–20.45], p = 5.76E−04), number 2 (OR = 5.96 [3.55–9.75], p = 2.21E09), number 10 (OR = 69.92 [20.70–188.44], p = 2.64E−07), number 15 (OR = 14.58 [6.00–30.72], p = 1.57E−06) and number 20 (OR = 7.13 [4.40–11.40], p = 7.74E−13) while the QPRT-KO upregulated genes were enriched in Kang-Modules number 2 (OR = 23.20 [11.25–49.97], p = 1.07E−16) and number 20 (OR = 3.54 [1.46–7.76], p = 4.18E−02). Kang-Module 17 was enriched for QPRT-KO-induced deregulated genes in general, i.e., for the merged lists of up and downregulated genes (OR = 20.41 [2.33–82.57], p = 2.45E−02; Fig. 3a). By plotting the eigengene value of the Kang-Module over time for each region, we observed that number 1 shows strong early upregulation in the hippocampus (HIP) and the amygdala (AMY) during embryonal development while it is downregulated in all tested brain regions after birth (Fig. 3b). Kang-Module 1 is also slightly upregulated in embryonal development in parts of the frontal cortex (orbitofrontal cortex (OFC), dorsolateral prefrontal cortex (DFC) and medial prefrontal cortex (MFC)), the striatum (STR), and the cerebellar cortex (CBC). Kang-Module 2 is overall downregulated prenatally and shows upregulation after birth, with maximum expression between the ages of 6 and 14, i.e., during middle and late childhood in OFC, MFC, posterior inferior parietal cortex (IPC), primary auditory (A1) cortex (A1C), inferior temporal cortex (ITC), primary visual (V1) cortex (V1C), and STR. Kang-Module 10 is only expressed in the CBC with a peak around the age of 6 years, while Kang-Module 15 is strongly downregulated during embryonal development in the CBC. The low expression of Kang-Module 15 in the CBC is stable across the tested time course, and it is slightly upregulated in other brain regions, showing peaks between the years 6 and 14 in OFC, DFC, ventrolateral prefrontal cortex (VFC), MFC, IPC, A1C, ITC, and V1C. Kang-Module 17 shows a constant active expression in the CBC over time with a peak during early development in the CBC. 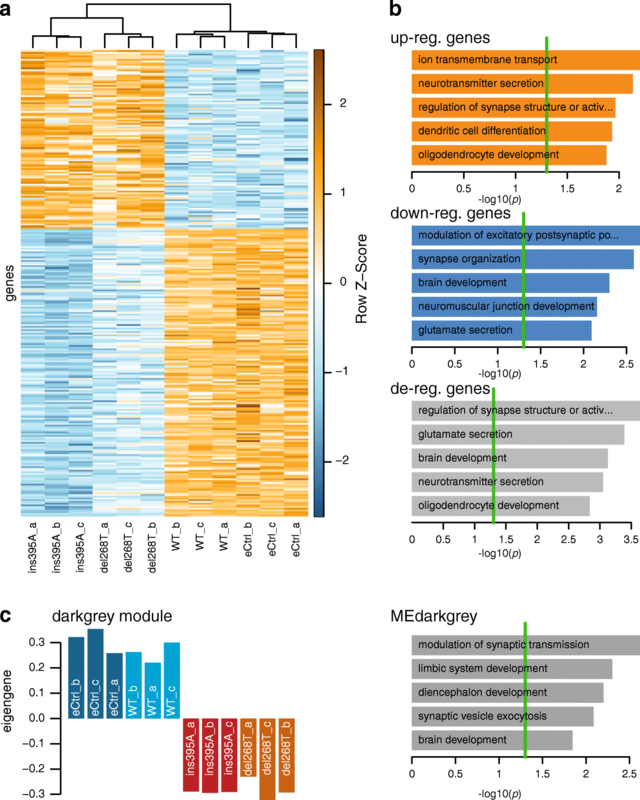 Kang-Module 20 is an overall early upregulated gene network downregulated after the age of ~ 2 years, showing the strongest downregulation between the years 6 and 14 in OFC, MFC, IPC, A1C, ITC, V1C, and STR. Based on our differential analysis, we report a causal relation between QPRT, located in the ASD-associated CNV region Chr16p11.2 and neuronal differentiation of SH-SY5Y cells. A gene dosage reduction or inhibition of QPRT affects morphological parameters during neuronal differentiation as well as the regulation of genes and gene networks that were previously implicated in ASD. This includes processes like synapse organization or brain development. In summary, our findings suggest a neurodevelopmental role for QPRT in the etiology of ASD in 16p11.2 deletion carriers. As expected from previous findings , in one deletion carrier with ASD, we confirmed that QPRT was expressed in a gene dosage-dependent manner strengthening the role of QPRT as a potential risk gene in the pathology of Chr16p11.2 deletion syndrome. By comparing our previously published transcriptome data of SH-SY5Y wild-type cells  to the morphological changes during neuronal differentiation described in the present study, we found QPRT to be correlated with the development of the neuritic complexity. These results suggest a potential regulatory link between QPRT and neuronal maturation. Our findings of the KD and KO cell models further underline this interpretation: the KD of QPRT led to subtle changes of SH-SY5Y neuronal complexity in line with previous reports using mouse models of Chr16p11.2  as well as iPS cells generated from 16p11.2 CNV carriers  and postmortem studies of ASD individuals . Inhibition of QPRT activity as well as genetic KO both led to cell death of differentiating but not proliferating cells. These findings suggest that enough protein is left for the survival of differentiating cells upon KD of QPRT while the loss of QPRT is lethal for differentiating SH-SY5Y cells. 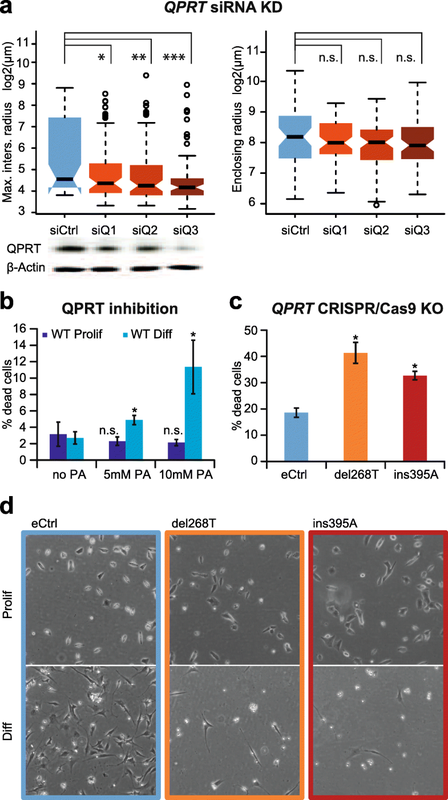 Interestingly, the administration of the QPRT substrate QUIN, which is a potent excitotoxin, did not show any effect on neither proliferating nor differentiating cells. Previous findings suggested that a reduction of QPRT, the only enzyme catabolizing quinolinic acid (QUIN), leads to an accumulation of QUIN, which in turn may induce neuronal cell death by over-activating NMDA-R and increase nitric oxide (NO) production . Altered QUIN levels could also lead to a change in NAD+ production which in turn could change poly (ADP-ribose) polymerase (PARP) activity . In QPRT-KO mice, the striatum showed an accumulation of QUIN leading to neurodegeneration  as well as altered expression of enzymes of the kynurenine pathway and of NMDA-receptors. No ASD-like behaviors were studied in these mice, but the animals showed no growth or developmental abnormalities. As the kynurenine pathway was associated with Parkinson’s disease , the authors performed a behavioral test measuring the stride length of WT and KO mice. Indeed, they reported shorter stride lengths in aged but not middle-aged QPRT-KO mice as usually seen in mouse models of Parkinson’s disease . In another study, no differences of histological features of the cerebrum of QPRT-KO mice were observed . Although we were not able to mimic QPRT loss in WT cells by application of increased QUIN levels, we tried to rescue differentiating QPRT-KO cells from cell death during differentiation by modulation of QUIN-related metabolism and signaling. Inhibition of NMDA-receptors was expected to protect QPRT-KO cells from the possible QUIN-induced excitotoxicity. However, the application of different concentrations of an NMDA-R inhibitor did not prevent cell death. Similarly, inhibition of NOS1 with the aim to reduce the production of NO did not affect viability. Finally, we tried to increase the viability of differentiating cells via the application of NAD+ to rescue PARP activity. Again, QPRT-KO cells could not be rescued from cell death during differentiation. In accordance with these observations, QPRT-KO cells did not show changes in the expression levels of any genes coding for PARP enzymes. In addition, QUIN could not be detected in any of our samples, and none of the metabolites of tryptophan catabolism was significantly changed upon KO of QPRT in the performed metabolite assays. Taken together, we conclude that the detrimental effect of QPRT loss on viability during SH-SY5Y differentiation is independent of QUIN levels as well as of QUIN-induced metabolic changes or the kynurenine pathway in general. To elucidate the underlying mechanisms of QPRT-KO-induced cell death during SH-SY5Y neuronal differentiation, we performed a hypothesis-free transcriptomic approach. These findings suggest that loss of QPRT may lead to an increased negative regulation of cytoskeleton organization and to an inhibition of neuronal differentiation and dendritic spine development. In our KD model, we observed an alteration of neuritic complexity, which strongly supports the functional role of QPRT in these processes. The functional association of QPRT with ASD is supported by the following results of our study: QPRT-KO led to inhibition of GABRB3, which has been well established as an ASD risk gene . GABRB3 codes for a subunit of an inhibitory GABA receptor. It is located on Chr15q11-13, a region strongly implicated in ASD . Similarly, the gene SNTG2 also downregulated in QPRT-KO cells, codes for a synaptic scaffolding protein involved in actin and PDZ domain binding. SNTG2 is located in 2p25.3, a region linked to intellectual disability  and associated with ASD . Furthermore, SNTG2 protein interacts with neuroligins (NLGN), and this interaction is altered by ASD associated mutations in the NLGN genes . QPRT was also found to physically interact with NLGN3 (neuroligin 3; ). Although the function of this interaction is still unclear, it is likely that QPRT is involved in the formation of the postsynaptic density of GABAergic neurons. KCNQ3, another ASD candidate gene, downregulated upon QPRT-KO, encodes a protein regulating neuronal excitability. Variants of this gene were found to be implicated in the development of ASD and epilepsies . Finally, we also found CNTNAP2, a well-replicated risk gene for ASD  located in 7q22-q36, to be downregulated in QPRT-KO cells. In a previous study, we reported CNTNAP2 promoter variants reducing transcription to be risk factors for ASD . Besides ASD-associated differentially regulated genes, we report six novel candidates (i.e., COX17, GUCA1A, COX17P1, VSTM2A, LINC01760, and ARHGAP20). At this stage, we cannot find any link to neuronal development for the photoreceptor-associated guanylate cyclase activator 1A GUCA1A, the preadipocyte development implicated V-set and transmembrane domain containing 2A VSTM2A gene, and the long intergenic non-coding RNA LINC01760. However, the cytochrome c oxidase copper chaperone COX17 (and its pseudogene COX17P1) and the Rho GTPase-activating protein 20 ARHGAP20 are functionally related to neuronal development: COX17 is part of the terminal component of the mitochondrial respiratory chain, catalyzing the electron transfer from reduced cytochrome c to oxygen, and might thus be involved in the regulation of oxidative stress and energy metabolism, both processes that have previously been associated with ASD . The ARHGAP20 enzyme is implicated in neurite outgrowth and thus potentially associated with the here observed neuromorphological phenotypes . Translating the in vitro transcriptomic effect of QPRT-KO in SH-SY5Y cells to the gene networks active during human brain development , we observed differentially regulated genes to be enriched in modules previously associated with cell cycle regulation (Kang-Module 1), transcription factors regulating progenitor cell fate (Kang Module 20), neuronal development (Kang-Module 10 and 20), morphogenesis (Kang Modules 17 and 2), and synaptic transmission (Kang-Module 2 and 15). In addition, the Kang-Modules identified to be affected by QPRT-KO were also reported to be highly co-expressed (ρ ≥ 0.68) with markers for glutamatergic (Kang-Module 10) and GABAergic neurons (Kang-Modules 2 and 15) or astrocytes (Kang-Module 2). In addition, Kang-Module 1 is implicated in the early development of the hippocampus and amygdala, two regions significantly associated with ASD after meta-analysis [71, 72]. These associations identified in the translational approach suggest that QPRT loss might trigger alterations in the development of excitatory/inhibitory neuronal networks, a pathomechanism postulated to underlie the etiology of ASD [73, 74]. In summary, our findings allow us to conclude that in the neuroblastoma model SH-SY5Y a loss of QPRT impairs neuronal development in vitro by changing genetic networks previously implicated in the etiology of ASD. To confirm these results and the role of QPRT in the etiology of ASD in general, further studies in other neuronal or animal models are needed. In particular, analyzing the above described QPRT-KO mouse model [30, 31] could elucidate the effect of QPRT loss at systems level. Here, we report QPRT, a gene within the ASD-associated 16p11.2 CNV region, to be essential for and causally related to SH-SY5Y neuronal differentiation in vitro. This corroborates postmortem findings of a disturbed neuronal development in ASD. The functional mechanism is still elusive; however, based on our results, we can exclude alterations of QUIN levels or other products of the kynurenine pathway in the here described SH-SY5Y model. Further, the transcriptomic approach suggests that a reduced availability of QPRT impacts on genes and networks associated with ASD, such as neuron differentiation, synapse organization, or the development of excitatory/inhibitory neurons. Overall this study suggests an alteration of QPRT expression or of QPRT related genes to be underlying the etiology of ASD in 16p11.2 CNV carriers. Further studies are needed to confirm our findings in more mature neuronal systems or animal models. We thank J Heine for technical support and J Ludwig and M Jones for fruitful discussions. The study has been funded by Dr. Paul and Cilli Weill Price for excellent early career researchers in medical sciences at the Goethe University awarded to AGC. The RNA-sequencing dataset supporting the conclusions of this article is available at the GEO repository, GEO accession number: GSE113734 at https://www.ncbi.nlm.nih.gov/geo/. Additional files are provided with the manuscript. AGC and DH designed the study and wrote the manuscript. DH, SL, and IS performed the experiments. CMF, RW, and AY supported the manuscript preparation. AGC, DH, NK, BR, and AY performed the statistical analyses. TA, BKG, and MMT shared their experience and protocols for CRISPR/Cas9 experiments. GJG and CKL shared expertise on tryptophan metabolism and performed the metabolite analysis. SF and IS helped in designing and performing siRNA experiments, as well as imaging of transfected cells in a high throughput manner, and shared their expertise and equipment. AGC, CMF, and AAP hosted fruitful discussions for project planning and strongly supported the project. All authors read and approved the final manuscript. All study participants have given written informed consent, and the genetic study has been positively reviewed by the ethic’s committee Frankfurt (No 267/09). All authors agree to publish the presented work. NIH Genetics Home Reference. https://ghr.nlm.nih.gov/condition/16p112-deletion-syndrome. Accessed 30 Apr 2018. NIH Genetics Home Reference. https://ghr.nlm.nih.gov/condition/16p112-duplication. Accessed 30 Apr 2018. ImageJ Sholl Analysis. http://imagej.net/Sholl_Analysis. Accessed 30 Apr 2018. CRISPR design. http://crispr.mit.edu/. Accessed 30 Apr 2018. Yousaf A, Duketis E, Jarczok T, Sachse M, Biscaldi M, Degenhardt F, et al. Mapping the genetics of neuropsychological traits to the molecular network of the human brain using a data integrative approach. bioRxiv. 2018. https://doi.org/10.1101/336776. SFARI Gene. https://gene.sfari.org/database/human-gene/. Accessed 30 Apr 2018.